The City of Hallandale Beach is proud to be home to four Heritage sites and one historic site. languages and was also an accomplished violinist, displaying his talents with the John Philip Sousa Orchestra during the 1896 grand opening of the Henry Flagler Royal Palm Hotel in Miami. embedded in the exterior stucco finish. The Italian glass sparkled in the sunlight and glowed in the moonlight. In 1926, when the Great Hurricane hit, dozens of nearby residents sought shelter with the family as their homes were damaged ordestroyed. The Curci home stood strong, sustaining only minor damage. Frank, Rosina and family lived in the home until the early 1950s. On December 24, 2013, Villa Providence was listed on the National Register of Historic Places. Be a part of Hallandale Beach Legacy. Purchase your own part of history and buy an engraved memorial brick to be placed in the yard of the Curci House. Check out Curci House Rentals! The Historic Hallandale Schoolhouse was built in 1910, and is the oldest building in Broward County known to have been originally built as a schoolhouse. When the 1910 hurricane destroyed the school, local citizens petitioned the Dade County School Board (Broward was formed in 1915) for a new building. The School Board claimed that it lacked the funds to replace the school but offered to contribute the lumber and other materials necessary to build another school house. A group of Hallandale residents traveled to Miami, picked up the wood and supplies, and delivered it to the site of the first school. The two-room structure was built with by volunteer labor. The last public school classes were held in the spring of 1916. The school sat abandoned for the next five years and in 1921 Bethlehem Lutheran Church purchased the building. The building served as a church learning center until 1966 when it was donated to the City and moved to its present location. As time took its toll on the wooden structure, the City stepped in to preserve the historical landmark in the City’s evolution. The City’s Department of Public Works craftsmen worked diligently to bring the building back to life. 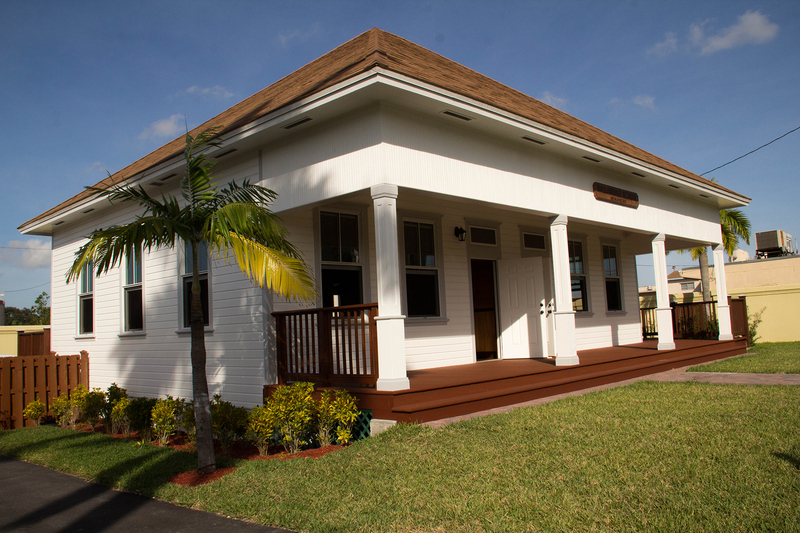 The Historic Hallandale Schoolhouse grand opening was held February 18, 2015. 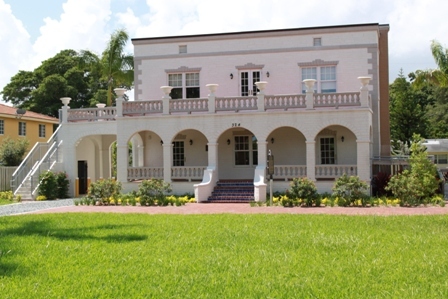 A Hallandale Beach Historical Site Sponsored by the Historical Preservation Trust and City Commission. Check out Historic Schoolhouse Rentals! 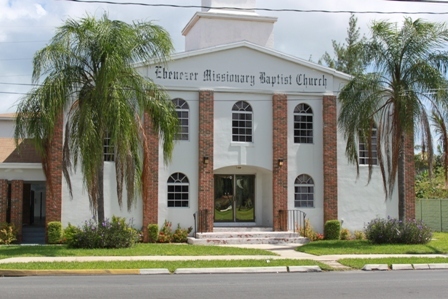 The Greater Ebenezer Missionary Baptist Church was established in 1909 by Sister Lougenia Johnson and Sister Missouri Wilson conducting Sunday School under a rubber tree. 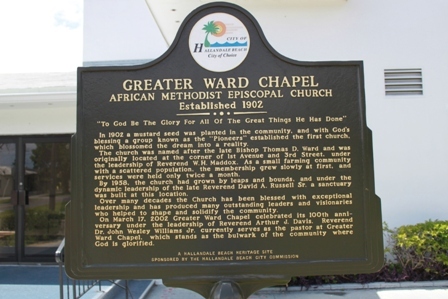 The Greater Ebenezer Missionary Baptist Church has ministered and served the Hallandale Beach and South Broward community for 100 years. In 1902 a mustard seed was planted in the community, and with God’s blessing, a group known as the “Pioneers” established the first church, which blossomed the dream into a reality. On March 17, 2002, Greater Ward Chapel celebrated its 100th anniversary. 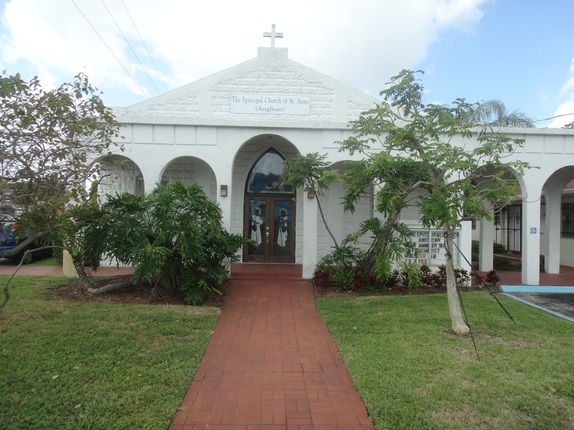 The Episcopal Church of Hallandale Beach, designated as St. Anne’s Church, was organized in 1914 by a group of Bahamians who had come to this part of Florida bringing with them their right traditions of the Anglican Church in the Bahamas. First services were held in the existing structure on March 21, 1948.